Urbanization process has been increasing the emission of air pollutants by cities for a long time, which has a great influence on citizens’ health. Researches have found solid evidences that people living close to busy traffic has higher risks to get lung cancers and other health issues. To improve the air quality, it is important for governments to set up stations to monitor the urban air pollution. However, if the government merely publish the air quality monitored by each station to the citizens, it is almost impossible for anyone to know the air quality in their neighborhood and to take necessary actions. What should the government do to protect their citizens? Fortunately, with process designer of SuperGIS Desktop and the web map service of SuperGIS Server, the governments are able to publish urban air pollution maps online with real-time Kriging analysis, as shown in the figure below. The Kriging analysis estimates values at locations which have no stations. With the map, citizens can always check the air quality around their neighborhood online and take necessary actions to protect their health. And the government can monitor the urban air pollution to improve the air quality in real-time. Here’s how they do it. First, prepare a point layer representing the location of the monitoring station and the monitored air quality, and a polygon layer representing the urban area. Open the 2 layers in SuperGIS Desktop and open SuperGIS Toolkit. To use the process designer, right click on the “SuperGIS Toolkit” and select “new toolkit”. Then right click on the new toolkit and select “new process” to open the process designer, as shown in the figure below. Re-name the new toolkit and process if necessary. To build the geo-process, simply drag “Calculate Z-Value As Raster” to the process designer. Also drag “Create Sample Dataset”, “Create Distance Search”, and “Create Statistical Model” to the process designer. 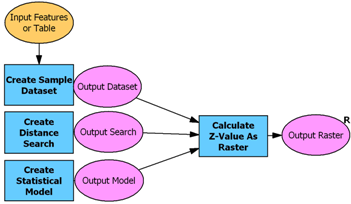 Then link their outputs to the “Calculate Z-Value As Raster” as its needed parameters. Right click on “Output Raster” and select “set as process result”, as shown in the figure below. Input your monitoring station layer and now they are all set. Run the process and get the result! To publish the map using SuperGIS Server, save the .sgd file which has been just built in SuperGIS Desktop. 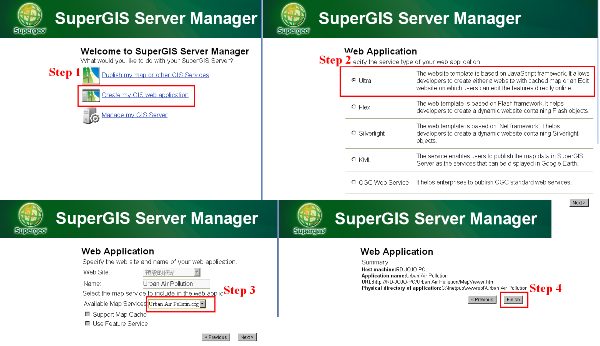 Open SuperGIS Server Manager and select “Publish my map or other GIS services” to publish the map. Follow the steps and name the service as shown in the figure below. Now the citizens are able to know if the air quality in their neighborhood is dangerous or not. They don’t need to worry about getting sick by exposing to dangerous environment ever. SuperGIS had just saved the day!